The first and most famous of all the Indian officers who served in Hodson's Horse. He was a very courageous and charismatic figure in the history of the regiment. Born in the Gujranwala district, the son of Sardar Dava Singh of Ruriala (date of birth unknown). His first military experience was as a cavalry officer in the Sikh army fighting against the British in the 1st Sikh War 1845-6. In 1852 he entered service with the British as a mounted policeman in Neville Chamberlain's Punjab Police. In June 1857 Mr Montgomery asked him to raise the first Risalah for Hodson. He served throughout the Siege of Delhi and most of the battles fought by Hodson's Horse. He was badly wounded at the battle of Nawabganj after capturing guns and displaying great bravery. He was well decorated, including the Order of Merit 1st class and the Order of British India 1st class. On the 9th March 1866 he was appointed as the first Risaldar Major of the 9th Bengal Cavalry, a post he held until his retirement in 1877. Having left military service he was made Honorary Magistrate at Amritsar and then manager of the Darbar Sahib (Golden Temple) at Amritsar. This post had been held by his elder brother, Sardar Jodh Singh for 13 years. He retained that post until his death on 16th March 1892. 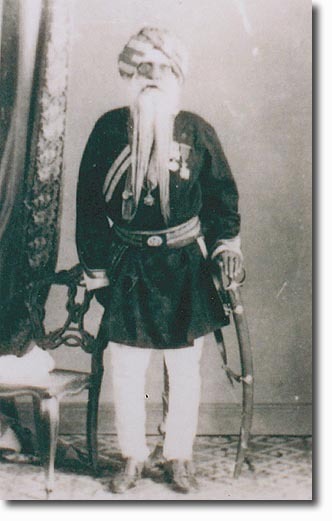 The picture shows him in later life, after his retirement, wearing his old 9th Bengal Lancers kurta, with gold belts and red kummerbund. His medals are partly obscured by his long grey beard, worn in the old style rather than rolled up. He wears spectacles and his white pag is worn low down on his forehead. His sword is an Indian tulwar rather than the army issue sword worn by younger officers. There is a large portrait of Man Singh hanging in the officer's mess of the present day 4th (Hodson's) Horse.